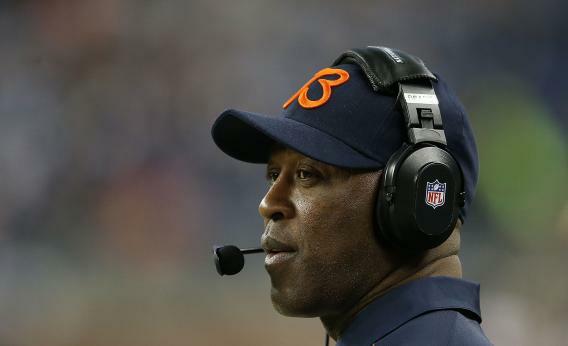 Lovie Smith fired: The Black Monday firing that doesn't make any sense. Lovie Smith, the coach who got canned on the NFL’s Black Monday for no good reason. Chicago Bears head coach Lovie Smith watches the action during the game against the Detroit Lions at Ford Field on December 30, 2012 in Detroit, Michigan. Romeo Crennel, Chan Gailey, Andy Reid, Pat Shurmur, and Norv Turner were fired on Monday for the usual reasons that coaches get fired. All of these guys either led franchises to horrible records (Crennel), disappointed their pitchfork-waving fan bases one too many times (Turner), led their franchises to horrible records and disappointed their pitchfork-waving fan bases one too many times (Reid), or coached in Buffalo/Cleveland (Gailey/Shurmur). Really, this could’ve been Black Monday 2011 or Black Monday 2010 or Black Monday 1812. Lovie Smith, then, was fired after leading a team to a record better than that of last year’s Super Bowl winner because a bunch of teams he didn’t coach happened to have good seasons. Also, he failed to prevent Jay Cutler from getting a concussion. When a coach gets fired because of things he can’t control, bloodthirsty fans will almost certainly explain it away by saying he’s bad at the things he can control. At least by the accounts of Bears facepainters, Smith was bad at all the little things that get on fans’ nerves, like timeout and challenge-flag deployment—the exact same stuff that supposedly makes Andy Reid unworthy of his Hall of Fame mustache. It’s not quite as dumb to blame a coach for misusing his timeouts as it is to run him out of town because the Packers couldn’t stop Adrian Peterson. Still, fans only talk about niggling things like clock management when their teams are losing. I’m guessing that Smith’s ability to tell time didn’t get worse as the season dragged on, nor did it cause Brian Urlacher to get hurt. It’s an excuse, not a cause, a transparently drummed-up charge on the order of canning a guy you don’t like because he took three pens from the supply closet. This is what we know about Love Smith. His defenses are always great. His special teams units have had an amazing run of success—according to Football Outsiders’ metrics, they’ve been in the top four of the NFL for the last seven seasons. His offenses have been mediocre. Add that all together, and you’ve got a coach who’s well above-average, one who could perhaps benefit from some better personnel on the offensive line and a run of good health for his star players. There are 16 games in an NFL season. 10-6 is a very strong record, and teams with that mark or worse have made the Super Bowl in four of the last five years. Four of Chicago’s six losses came by one score or less. You can blame Lovie Smith for that, or the fact that some dude in Moline washed his lucky shirt at the halfway point of the season. Each of those excuses would make just as much sense.